The General Medical Council (GMC) outlines its expectations of the medical student in the ‘Outcomes for Graduates (formerly known as Tomorrow’s Doctors). In this document, the newly qualified doctor is described as a scholar or scientist, practitioner and a professional. As the educator of students, the medical school plays an integral role in providing the resources and environment which will allow easy transition of the undergraduate student into a competent doctor with skill-set to fulfil the three fundamental roles outlined above. In addition, it is a requirement by the GMC for the medical school to provide a sound learning environment and culture. Medical schools have also been made responsible for the support of students i.e. through the provision of confidential counselling, careers support and occupational health services. It is therefore transparent that the role of the medical school clearly extends much further than acting as a port of knowledge for simple delivery of the core curriculum. In reality, the medical school must act as supportive platform that enables its students own personal development to allow them to recognise and achieve their maximum potential. Personal Mentoring Scheme – The medical school currently has a personal one-to-one mentoring scheme for all students for the purpose academic, careers and pastoral support. However, personal mentors are not always fully aware of their roles and of the students’ expectations. In particular mentors that do not have a clinical background were not aware of the future training pathway and entry requirements of the student’s desired career choice. Intercalated Bursary information – transparency in the application process. Value of Student-run Societies in Personal Development – Student-run academic societies make a very valuable contribution in providing opportunities related to academic and careers support e.g. Lectures on career pathways, learning support, one-to-one mentoring etc . Such events should be recognised formally and integrated with the medical school for further development. The Foundation and Academic Foundation Program – the application system and further information on the Academic Foundation Program. 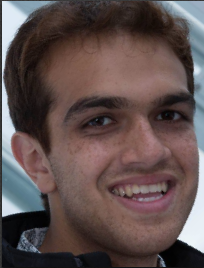 In particular students are not always aware of how their application could be enhanced. Early information on how students can prepare their portfolio would help them this issue- this is principally applicable with regards to the Academic Foundation Program. to act as a base for students with academic and learning support material and contacts. Prizes – Information on forthcoming prizes available for application with application deadlines. Careers information: – currently, a link to NHS careers. To be enhanced. Bursary information: Information on financial aid. 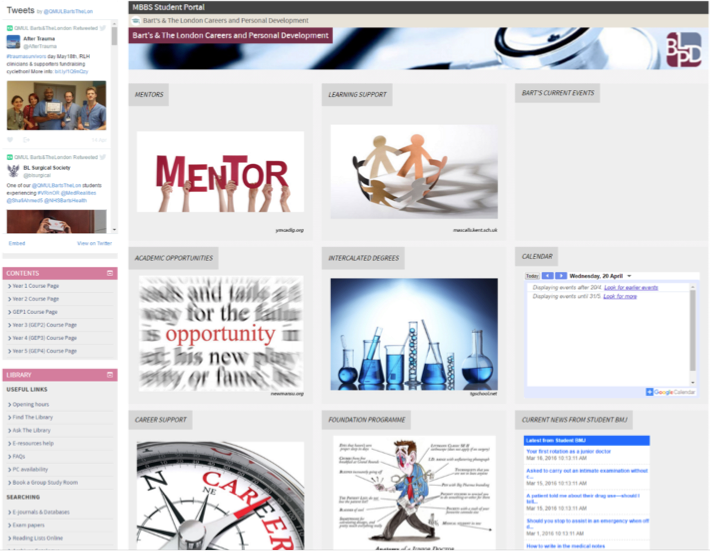 Information for Personal Mentors: Guides for personal mentors employed by the medical school, to provide information of their role, and how they can best aid students in different aspects of medical school, be it for academic, careers or pastoral support. Learning Support – Information and advice on learning and revision styles and contact details of staff, study skills and educational societies for further help and support if required. Academic Twitter Feed – Twitter feed for news on new opportunities and events plus celebrating student success. Development of the BLPD page brought up some interesting challenges from a technical point of view. We started with an idea which envisaged a timeline containing links to information that Students would need throughout their year at different times, such as links to resources on preparing for a clinical skills session before their first timetabled session. While the idea was there, trying to develop it on QMPlus proved to be too complicated and the end result was a course page with 50 sections, one for each week in the academic year. On top of this, the design of the page looked vastly different to current pages on QMPlus that student were already familiar with, thereby risking low usage of the page in the long run. Instead we opted for a familiar 3×3 image grid linking to the above mentioned sections, removing the collapsible sections altogether. The individual sections had content from different departments of the medical school, and so part of the time allocated for this project was spent meeting with various members of staff to determine what they wanted their page to contain and what it would look like. All staff were very keen on the idea and had a good idea of what they wanted in their page, some requested to have more than just information on the page, and asked for sections where students could interact with the content or department. 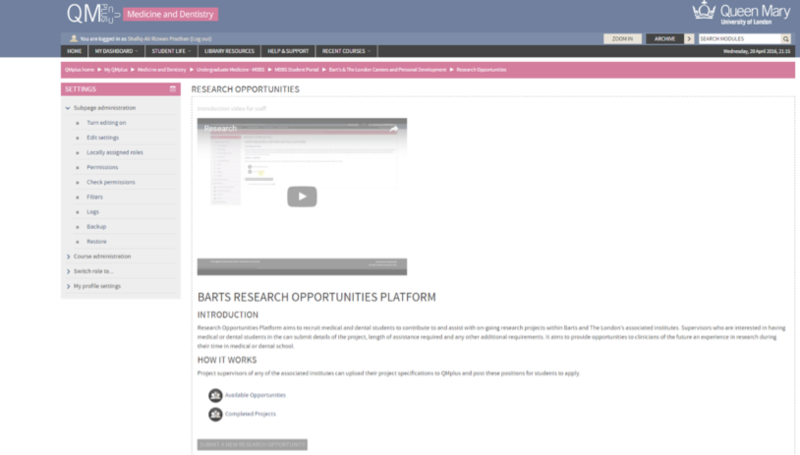 For example, the research opportunities pages have a full application system built into the subpage. This consisted of a jot-form form appearing in a light box where staff could submit new research opportunities. One of the staff members would then proof the submission and place it as a new topic on the current opportunities forum. From there, there was another jot-form (again in a light box) which students could bring up to apply for the research opportunity they wanted to work with. Access for systems like this was crucial to having it on the page. We had to restrict what students could access and do on the system. For example, the form to submit new opportunities was “hidden” on QMPlus which meant while students could not see it or use it, staff members were able to insure the button and submit the information. The forums too had custom permissions put on them, in the case of the research opportunities, stunners were able to reply to topics (in this case each topic was a research opportunity) but they were not able to create a new topic. Once the research was complete, the topic would then be moved to the completed forum, where no replies were allowed at all. 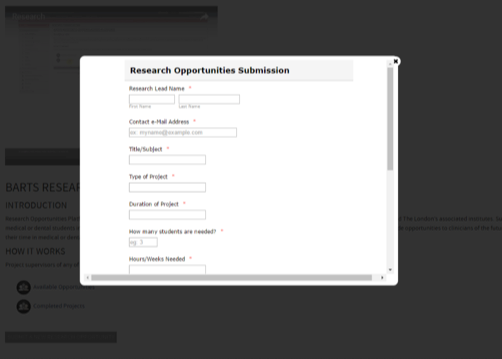 The research opportunities page on BLPD has the button at the bottom that is hidden so only staff can submit a new opportunity. The training video at the top is again hidden so only staff can see it. So far this has been accepted very well by the various departments, with some commenting on the innovation used to teach the staff. The advantage of the videos is that they are always available and can always be referred to if needed, no more written instructions that can be lost! However written instructions and one-to-one meetings were offered if staff wanted them to understand their page. Each page has its own video which is found at the top of the respective page, again hidden so only staff can see and refer to them. Overall the creation of BLPD has been incredibly rewarding and has been educational for me, allowing for more understanding of a custom Moodle solution and the limitations and workarounds that had to be figured out to create a solution that was required. I look forward to many more like it!